The Stanford men already have the top junior in the world, Axel Geller. Another top recruit will join the Cardinal next year as fourth-year coach Paul Goldstein continues to rebuild the traditional power. Sixth-seeded Alexandre Rotsaert of Boca Raton, Fla., reached the quarterfinals of the prestigious Eddie Herr International Championships with a 6-4, 6-4 victory over 12th-seeded Carlos Lopez Montagud of Spain today. Rotsaert, ranked 10th nationally in the 18s, will face top-seeded Timofey Skatov of Russia in the clay-court tournament in Bradenton, Fla. Skatov eliminated 16th-seeded Filip Cristian Jianu of Romania 7-5, 6-1. Two Northern Californians, meanwhile, advanced to the semifinals in the boys and girls 14s, respectively, on hard courts in Bradenton. No. 3 seed Aidan Mayo of Roseville in the Sacramento area outplayed No. 7 Joel Pierleoni of Great Britain 6-4, 6-2, and No. 2 Vivian Ovrootsky of San Jose beat Kyoka Kubo of Japan 7-6 (2), 6-3. Ovrootsky is ranked second nationally in the 14s. Adrian Andreev, Bulgaria, and Keenan Mayo, Roseville, Calif., def. Nicolas Mejia, Colombia, and Uisung Park (1), South Korea, 7-6 (3), 6-4. Alexander Bernard, Naples, Fla., and Aidan Mayo (1), Roseville, Calif., def. Fnu Nidunjianzan, China, and Ryota Kaneda, Japan, 6-1, 6-3. 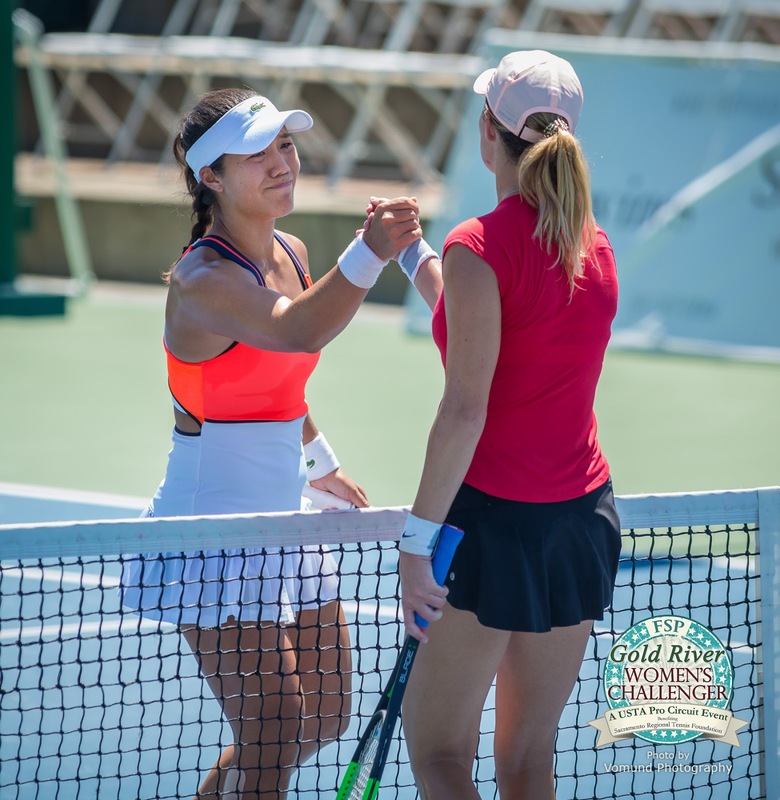 Hina Inoue, Los Gatos, Calif., and Vivian Ovrootsky (1), San Jose, def. Dasha Plekhanova, Canada, and Gavriella Smith, New Orleans, 7-5, 7-5. Stanford-bound Alexandre Rotsaert, seeded sixth from Boca Raton, Fla., edged Andrew Paulson of the Czech Republic 2-6, 6-4, 7-6 (0) today in the first round of the 18s in the prestigious Eddie Herr International Championships in Bradenton, Fla.
Rotsaert, who will join the Cardinal next fall, will meet the winner of the match between Seon Yong Han of South Korea and qualifier Allan Deschamps of France. Dostanbek Tashbulatov of Kazakhstan wore down Keenan Mayo, who grew up in the Sacramento suburb of Roseville, 6-1, 1-6, 6-0. Mayo will attend Illinois next fall. In the girls 18s, Katie Volynets of Walnut Creek in the San Francisco Bay Area defeated Himari Sato of Japan 7-6 (4), 4-6, 6-0. Volynets, who won the 16s last year, will turn 16 on Dec. 31. Second-seeded Maria Lourdes Carle of Argentina dismissed wild card Carolyn Campana of Hillsborough 6-1, 6-0. Also, Victoriia Dema of Ukraine beat Niluka Madurawe of Sunnyvale 7-5, 6-1. Hillsborough and Sunnyvale also are Bay Area suburbs. Third-seeded Aidan Mayo, Keenan's brother, and second-seeded Vivian Ovrootsky, from San Jose, advanced in straight sets in the boys and girls 14s, respectively. Top-seeded Lukasz Kubot of Poland and Marcelo Melo of Brazil beat fifth-seeded Bob Bryan and Mike Bryan 6-4, 6-3 today in a round-robin match at the ATP Finals in London. Kubot and the 6-foot-8 (2.03-meter) Melo, this year's Wimbledon champions, improved to 2-0 in the Woodbridge-Woodforde group to clinch a berth in Saturday's semifinals. The 39-year-old Bryan twins, four-time champions, fell to 1-1. To advance, the ex-Stanford stars must defeat seventh-seeded Ivan Dodig of Croatia and Marcel Granollers of Spain on Friday, and Kubot and Melo must beat fourth-seeded Jamie Murray of Great Britain and Bruno Soares of Brazil. Murray and Soares routed Dodig and Granollers 6-1, 6-1 to improve to 1-1 in the tournament featuring the top eight teams of the year. Dodig and Granollers are 0-2. French Open champs Ryan Harrison of Austin, Texas, and Michael Venus of New Zealand lead the Eltingh-Haarhuis group at 2-0. The Bryans won the ATP Finals in 2003 and 2004 in Houston and 2009 and 2014 in London. They have won a record 16 Grand Slam men's doubles titles but none since the 2014 U.S. Open. The Bryans grew up in Camarillo in the Los Angeles area and now live in Florida. 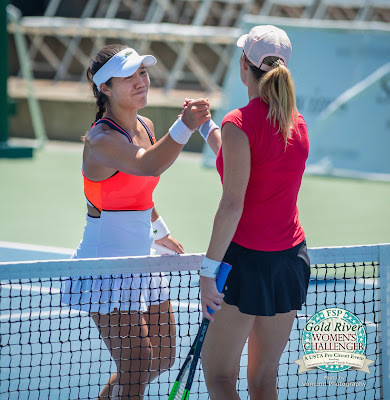 One week after Kristie Ahn won the biggest title of her career, her former Stanford teammate Carol Zhao did the same. The unseeded Zhao, a 22-year-old Canadian, beat fourth-seeded Fangzhao Liu of China 7-5, 6-2 on an outdoor hard court today for the $100,000 Shenzhen (China) title. "It's been a long way here since January and I owe this to a small group of people whose belief in me never wavered even when mine did," Zhao tweeted. "There are still many, many more miles to go but I'm so so grateful for you, and for this." Zhao soared from No. 221 in the world to a career-high No. 150 with the title. Her only previous singles crown came in a $25,000 tournament in Nanao, Japan, in early September. Zhao, 5-foot-5 (1.65 meters), reached the NCAA singles final as a sophomore in 2015, losing to Jamie Loeb of North Carolina. Zhao turned pro in June 2016 after helping Stanford claim its 18th NCAA women's team title. Florida is next with seven. Ahn, a 25-year-old American, won last week's $80,000 RBC Pro Challenger in Tyler, Texas. Ryder Jackson and Ashley Yeah won the boys and girls 18 titles, respectively, in the NorCal Junior Fall Singles Sectional Championships last weekend at the Broadstone Racquet Club in the Sacramento suburb of Folsom. The second-seeded Jackson of Nicasio beat unseeded Aryan Chaudhary of Santa Clara 6-3, 6-4. The top-seeded Yeah of Los Gatos outplayed second-seeded Rachel Eason of Union City 6-4, 6-2. Kush Patel (2), Cupertino, def. Sidharth Jangbahadur (1), Palo Alto, 6-2, 6-2. Allura Zamarippa (5), Saint Helena, def. Alexis Johnson (9), Fair Oaks, 6-1, 6-4. Alex Koong (2), Los Altos, def. Lucca Liu (5), Palo Alto, 6-3, 6-4. Tomi Main (1), Seaside, def. Arushi Malik (5), Cupertino, 6-1, 6-1. Mitchell Lee (2), Oakland, def. Siddharth Moturi (1), Monterey, 8-6. Natasha Rajaram (2), Cupertino, def. Michela Moore (9), Monte Sereno, 8-2. The United States recorded one victory on the opening day of the Fed Cup final. But it didn't come from U.S. Open champion Sloane Stephens. 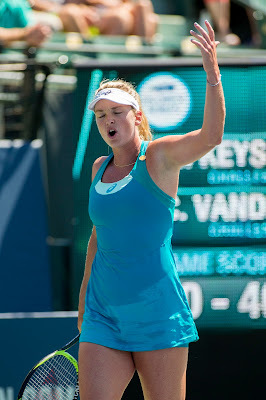 CoCo Vandeweghe, who cracked the top 10 for the first time in the year-end rankings at No. 10, defeated 87th-ranked Aliaksandra Sasnovich 6-4, 6-4 in today's first match in Minsk, Belarus. But the 13th-ranked Stephens, who grew up in Fresno, lost to 19-year-old Aryna Sabalenka, ranked 78th, 6-3, 3-6, 6-4. Stephens, 24, is 0-5 since beating countrywoman Madison Keys for her first Grand Slam title. The best-of-five series will continue on Sunday with the reverse singles matches followed by doubles. The United States has won 17 Fed Cup titles, more than any other team, but none since 2000. The U.S. is playing in its first Fed Cup final since 2010 and Belarus its first ever. Vandeweghe, 25, reached her second Bank of the West Classic final at Stanford in August, losing to close friend and countrywoman Madison Keys. As always in the Fed Cup and Davis Cup, the series between the United States and Belarus is as noteworthy for who's missing as for who's playing. Absent are Serena Williams (maternity leave), 37-year-old Venus Williams (skipping Fed Cup this year), Keys (wrist) and Bethanie Mattek-Sands (knee surgery) for the United States and Victoria Azarenka (child custody issues) for Belarus. Serena Williams, Venus Williams and Azarenka are former world No. 1s in singles with multiple Grand Slam titles. The same goes for Mattek-Sands in doubles. Stanford's Michaela Gordon and Emily Arbuthnott lost to unseeded players today in the third round of the ITA National Fall Championships in Indian Wells, Calif. However, they reached the doubles semifinals together. The 12th-seeded Gordon, a freshman from Saratoga in the San Francisco Bay Area, fell to Bianca Turati of Texas 6-2, 7-6 (7). Arbuthnott, a sophomore from England, succumbed to Marie Leduc of Clemson 6-1, 6-2. Unseeded in doubles, Arbuthnott and Gordon edged fifth-seeded Rosie Johanson and Meghan Kelley of Virginia 3-6, 7-6 (5) [10-4]. Arbuthnott and Gordon, who have won all three of their encounters in match tiebreakers, will play third-seeded Kelly Chen and Samantha Harris of Duke. Chen and Harris beat Elena Christofi and Morgan Coppoc of Georgia 6-4, 7-6 (4). Emily Arbuthnott of Stanford ousted sixth-seeded Katarina Jokic of Georgia 6-1, 2-6, 6-1 today in the second round of the ITA National Fall Championships in Indian Wells, Calif.
Arbuthnott's teammate, 12th-seeded Michaela Gordon, advanced with a 6-2, 6-4 victory over Shiori Fukuda of Ohio State. Arbuthnott, a sophomore from England, is scheduled to face unseeded Marie Leduc of Clemson for a quarterfinal berth. Leduc surprised 15th-seeded Maya Sherif of Pepperdine, 4-6, 6-1, 6-3. Sherif, a senior, transferred from Fresno State after sophomore season. Gordon, a freshman from Saratoga in the San Francisco Bay Area, will meet unseeded Bianca Turati of Texas. Turati knocked off fourth-seeded Ena Shibahara of UCLA 7-6 (4), 6-2. Shibahara tops the preseason national rankings. Both the third round and quarterfinals are set for Friday. Top-seeded Anna Danilina of Florida and third-seeded Karla Popovic of Cal lost in the first round on Wednesday. Second-seeded Ashley Lahey of Pepperdine remains alive. Arbuthnott and Gordon also reached the doubles quarterfinals, beating Gabrielle Andrews and Jada Hart of UCLA 7-5, 4-6 [11-9]. Arbuthnott and Gordon will play fifth-seeded Rose Johanson and Meghan Kelley of Virginia. All men with Northern California connections have been eliminated in singles and doubles. Victor Pham, a Columbia junior from Saratoga, lost to ninth-seeded Alfredo Perez of Florida 7-6 (3), 6-4. Logan Staggs, a UCLA senior from Tracy, fell to 10th-seeded JJ Wolf of Ohio State 6-3, 6-1.